Batug is a very sleepy village. There are only 134 homes with a 500 population. It was a very quiet time growing up. People were focused more on their family. Lights out by seven. Sleeping by eight. Very normal, simple life. We have garden in the back. Catch the fish in the river. We eat caribou, frogs. Dogs also. Dogs? That’s a bit different from America. What did most people in Batug do for work? As you can see we have many coconuts here and that’s the primary source of livelihood. Every three months, they harvest the coconuts and sell them to an oil company and use them for oil or sugar. And now you can see we can also make use of the wood from the coconut tree. 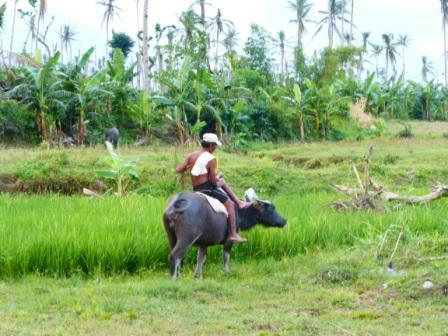 We don’t have so many lands to plant rice fields here so our main source of income is coconuts. 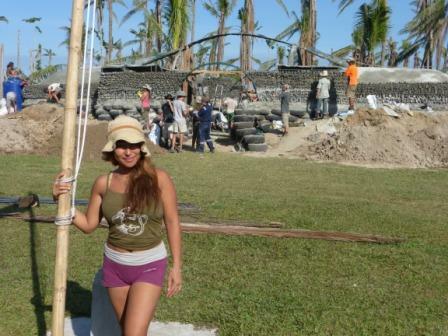 And Yolanda knocked most of the coconut trees down? Most of them. At least 80% as far as I can see. 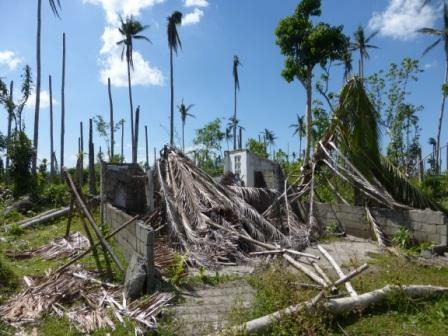 When Yolanda came through, which structures stayed up and which were destroyed? Those made of nipa huts and bamboo didn’t stand any chance with wind of 370 km/hr. As I landed here in Tacloban I saw that even the airport didn’t stand a chance, and that’s made of thick concrete walls and steel, so I thought I knew the fate of my village as I was traveling here. But I was so thankful that the school actually saved many people’s lives. It’s only the roof that came off. Nobody actually died here in the whole village. But a lot of people died in Tacloban because of the water surge. Here, according to what the community is saying, it was only the wind. It was making this noise like this engine. Like turning the engine on. That’s the sound of the wind. And they say that from here to ten feet you cannot see anymore because of the wind. It’s like this big fog. Would you say that Yolanda was the most powerful storm this community has seen? My mom told me that she’s never come across something so strong in her whole life. She was born here. Also the other seniors here. They’ve never seen anything like this. How often do typhoons come through? We get visited by twenty typhoons every year… but it never knocked down any houses or this many trees. How did Earthship wind up here in Batug of all places? This organization called Earth Village approached me and they said, ‘We’ve contacted the Earthship organization and they need land to build one, the first Earthship in the Philippines.’ So I offered them my land and said, let’s build it in Batug, right on the school land. The government is never going to give any extra rooms because they’re busy building other schools so just build it here. It’s perfect. We have enough land. At first there were a lot of problems with permits and requirements, and the original venue for the Earthship was in Dulag, but with our perseverance we were finally allowed to build here. Let me just say, you’ve done a great job. It’s amazing to see someone like you taking care of your own people. Well, you know, I feel that it’s actually a privilege. Helping people is not something that you choose. It’s offered to you. And since I’ve been based in Hong Kong for such a long time I’ve always been trying to find my way back to connect with my roots. And this was a great window for me to start doing that. What does the community think of all these people coming here? They’re very happy. Before this they’ve never seen so many foreigners in their lives. Working with them, they’re just so thankful. We are in a sleepy town. If you google Batug, it’s not even on the map. But when I talked to Mike Reynolds yesterday, he said, now forever we’re going to be in google maps because of the Earthship. Better get used to the visitors. I am so proud of my community. The way they are cooperating and working with the Earthship organization. How they’re welcoming all the foreigners. So much hospitality. I mean, they’ve basically lost everything, but then they still have a smile on their face because when you don’t have so much, it doesn’t hurt that much because you started out with nothing. If you ask them what they want for the next five years they say, we just want the roof back. What else? We just want our roof. You can really desire for too much now because you know that a Yolanda, a typhoon like that is possible. It can happen. And take it all back again? It can take it all right back again. But if you don’t have anything, if you started with nothing, then it’s not too painful. It’s almost healthy in a way. You don’t get so attached to material things. Exactly. And they live with that. After the typhoon strike they actually have a trauma. They can’t sleep. They are not motivated. A group that was first here on the ground had a hard time motivating the people to get up and start rebuilding. They said, why do we need to rebuild? There’s just going to be another typhoon coming, lurking on the horizon. For the first month they were just sad. They were still traumatized. They would sit and stare at the sky. Some of them are just happy that all their kids are alive. Phil was saying that if Earthship Biotecture could get the funding they’d like to come back and design smaller, cheaper, more simple homes that would be designed out of coconut trees and bamboo and local materials, but that could also be typhoon-resistant to some extent. Is that something that you would be interested in? Do you think that should be pursued? That’s one of the questions that’s come up with the community. I asked them, so you think you guys can build this as your home? And they say, yeah it’s possible, but we don’t have the materials. But I told them, you can downgrade. You can use mud which is what they’re doing now at one of the houses or you can use bamboo but with the same concept. What the Earthship is doing is showing us that a different way is possible. There’s resources out there. We don’t actually have to follow the materials that they’re using. We should use whatever is available to us.